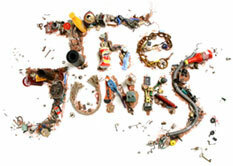 The Junks is created by award winning writer/director Zlatin Radev who recycled real objects from the everyday world to give life to a fascinating new world. They are ugly, dirty and lacking in good manners - they are The Junks. Vibrant and busy, Junk City is governed by the gluttionous Mayor-Mayor and run by the arrogant Irons. Will the friends have the courage and the ingenuity to escape their iron grip?